Communication networks are a vital tool for any business, so it is important to be able to monitor and manage your radio network at all times to ensure it is operating efficiently. Modern IP-based DMR networks make it easy for network administrators to monitor the performance of the radio system in real time and to control network elements and terminals. Hytera’s Network Management System (NMS) allows network administrators to configure, monitor and manage the infrastructure, functions and various services of the network, including subscriber management. Reporting tools alert administrators to problems on the network. NMS is software package made up of a number of highly automated modules. This means it can be tailored to suit the size and specifics of your particular network. You just use the modules you require without having to buy the entire package. New modules can easily be added when required. Authorised personnel can log on to the network and carry out tasks from anywhere using a standard network browser. 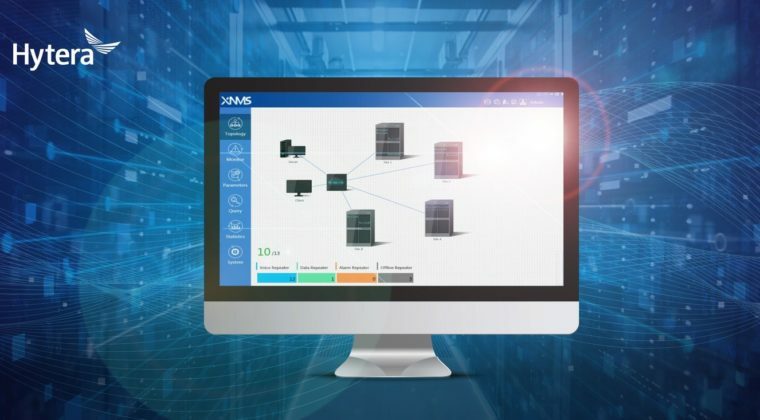 The decentralised architecture of the NMS is designed to protect your mobile radio network against data losses and to optimise operational sequences. Network administrators and managers can monitor how the radio system is performing and when required change the parameters. New firmware can be uploaded to switches, base stations and repeaters. Call records and other files can be accessed and downloaded. Fleet management is made easy, as fleet and subscriber information can be viewed, accessed and amended. Radios can also be monitored and controlled remotely allowing managers to stun, revive and kill terminals, as well as monitor and enable GPS location-based features and respond to man down and lone worker alerts. Another major benefit of DMR systems is over the air programming (OTAP), which allows managers to execute remote software and firmware updates. Radios can be reprogrammed and upgraded remotely, meaning they no longer have to be physically brought back to a central location and manually upgraded. Managers can change IDs, channels and frequencies on hundreds of radios in a matter of seconds over the air. In addition, mobility management services such as registration/deregistration, group login/group log off, roaming and handover can all be carried out remotely. Security can also be managed by network administrators. Hytera’s DMR system supports the DMR Association procedure for encryption transmission via the air interface. End-to-end encryption of voice and data with cryptographic systems such as ARC4 40-bit or AES 128-bit or 256-bit are available. Managers can select and deselect radio transceivers (enable/disable), as well as authenticate users, devices and applications. You can choose whether to be in control of all these aspects yourself as the customer, or you can decide to let your authorised Hytera dealer or other third party network operator carry out these kinds of tasks on your behalf. We will address these options in the next blog.